Search engine optimization has the goal of creating pages which are more likely to be found when people use search engines. The point is to get folks who might be interested in your site, to visit it and then do something. If your site a business one, you might want visitors to buy your product. Fundamentally, the goal of search engines is to help searches find relevant, quality content. Creating such content should also be your goal for your site. Some web site owners, instead of doing that, have been accused of using "black hat" tactics to fool search engines into ranking undeserving pages higher, sometimes for unrelated terms. But why spend time and energy playing tricks, when you can create great content and get good results? Otherwise, every time Google or Bing update their algorithms, you'll have to scramble to figure out new ways to game them. The key to search engine optimization is, you guessed it, keywords (or, more accurately, keyphrases). Even if you're not really concerned about SEO, you can get better your points across if you use the vocabulary people are already using. So it's helpful to use the right words. Sites such as Google AdWords Keyword Tool and Wordtracker can tell you what keywords people are searching for that are related to your topics. You can read books such as Search Engine Optimization for Dummies and Building Your Business with Google for Dummies to learn more. I've read both and recommend them as starting points. A lot has been written about SEO on sites such as SEOmoz and SEO Chat, and it can get pretty technical. 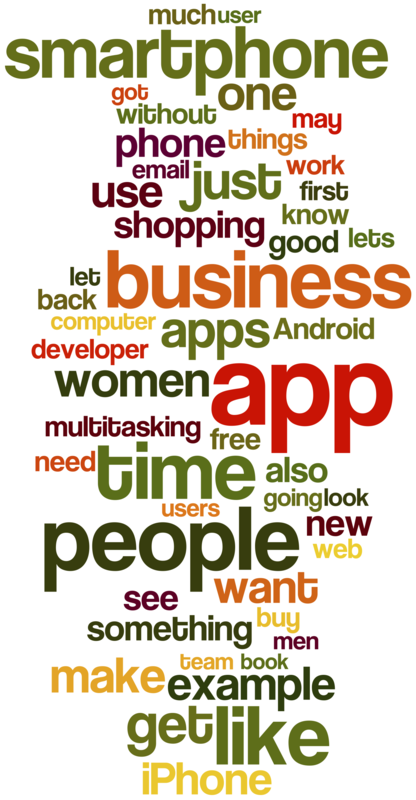 You can see that terms like app, business, smartphone, iPhone, and shopping are among the most popular. This is good news because the blog is supposed to be about smartphone apps, shopping, and entrepreneurship. If the Wordle showed that our top terms were unrelated to the goals of our site, we'd have to think about either a) changing the kind of blog posts we write, or b) changing the business we're in. Wordle doesn't weight keywords the way search engines do, for example by giving more weight to those in the page's title. But it's a creative way to see what words you're using so you can tell if your content is on target.